Prank video destroying new Apple smartphone receives 10m views, with some seemingly tricked into making 3.5mm hole in the bottom of their devices. The video was produced by Sacramento, California-based Ukrainian YouTuber Taras Maksimuk who “specialises in smashing technology for your pleasure” according to his profile. Some of Maksimuk’s other videos include “what happens if you microwave an iPhone 7” and “can the iPhone 7 survive in liquid nitrogen for five minutes”. 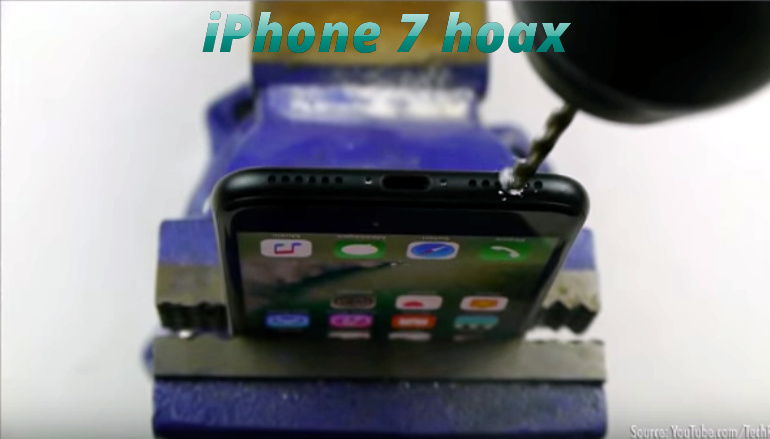 In total Maksimuk has seven separate videos showing him destroying iPhone 7s, but that seemingly hasn’t stopped people drilling holes into the bottom of their new iPhones and causing irreparable damage. Hoax alert! The video described above is a HOAX. You can’t really create a speakerphone by just drilling a hole in your iPhone 7! Doing so will possibly destroy your iPhone! Please ignore this DIY video hoax and warn others about it.